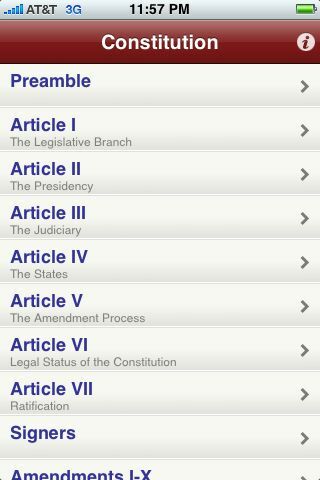 Review: Constitution - the Constitution in your pocket - iPhone J.D. Justice Hugo Black, known for his literal reading of the U.S. Constitution, used to always keep a well-worn copy in his pocket so that he could take it out and quote from it. He served on the Supreme Court from 1937 until he died in 1971, so he missed even the early days of the personal computer revolution. But were he alive today, perhaps he would trade in his paper copy for an iPhone loaded with the Constitution, a free application from Clint Bagwell Consulting. All of your favorites are here. You can sing along to "We the people ... in order to form a more perfect union" and wonder why the Schoolhouse Rock version of the Preamble omits the phrase "of the United States." 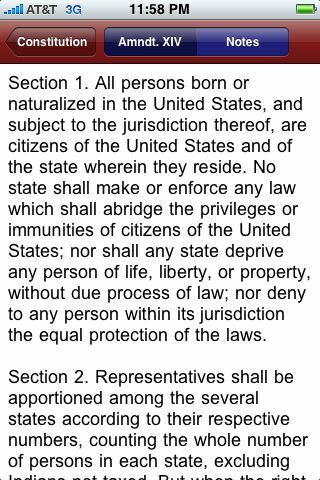 You can read the Bill of Rights and the Fourteenth Amendment, which are truly as timely today as they were in 1789 and 1868. You can read the Eighteenth Amendment's prohibition of intoxicating liquors and then toast the Twenty-First Amendment's repeal of prohibition. This application is simple, and frankly that is a good thing. The main page is just a table of contents and you tap to read the full text of a section. And each section includes notes including, for example, the dates of ratification of each of the amendments. The application is quick and easy to use. At the risk of fueling the debate over whether the right to privacy is in there, I do wish that the application had a search function, but otherwise this application is great. It is free, it takes up virtually no space on your iPhone, and if you are a lawyer -- or, for that matter, just a good citizen -- you really have no excuse not to download it. Click this button to download Constitution for iPhone and iPod Touch from the iTunes Store.